An new kind of word puzzle game, Boggle meets Tetris. Ack!words 2.1 is other software developed by Ack!soft. Ack!words is a brand new concept in word/puzzle games. It's as addictive as tetris and as challenging as boggle and scrabble combined. To play, you connect adjacent letters (in any direction) to form words. When you find a word, the letters are removed from the board and the letters above fall down. The object is to make large words, using hard letters while ultimately clearing the board. This other software is shareware, which means you can download and use Ack!words 2.1 for free during the trial period (usually for 30 days). At the expiration of the period you will have to buy the other product for $10.00. Ack!words 2.1 is available at regnow and Ack!soft website. Ack!words 2.1 supports different languages (including English). It works with Windows 98/XP/Vista. We have tested Ack!words 2.1 for spyware and adware modules. The software is absolutely safe to install. We has completely tested other software Ack!words 2.1 many times, written and published the interesting article and uploaded installation file (6004K) to our fast server. Downloading Ack!words 2.1 will take minute if you use fast ADSL connection. 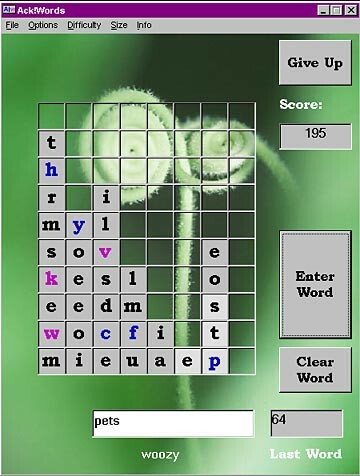 WordOMatic is a Word Search game with elements of puzzle and strategy. A word puzzle where you navigate a maze, forming adjacent letters in words. YeeHaw! Ready to rustle up some words? You'll have to be quick on the draw to make words out of letters as they fall but don't worry, they don't have to be adjacent -- just so they make a word. Puzzle Word offers more word-finding fun! Click on letters in the grid to form words, and watch the letter tiles disappear and collapse! Every move creates new combinations of letters.